Lila Moonlight: It's All About the Crown - - - NOT! It's All About the Crown - - - NOT! So, what's with the new blog header? Oh, come on. I can hear you thinking it. Tee hee! Well, I think you deserve an explanation and I have one for you. Ever since I was a little girl, I've been enamored with being a princess. (I'll bet many of you have as well.) When I was a wee one, my favorite special television night (even more so than when the Wizard of Oz showed) was when Leslie Ann Warren was on Cinderella. She was the most beautiful princess e-ver! I loved her rags to riches story and how the prince on the shining horse chose her. She was the fairest one in the kingdom. When our girls were young teens that version of Cinderella (with Leslie Ann Warren) was coming on the television. I built it up and told them we were having a very special "girls' night." We got our blankets, our pillows, dimmed the lights, lit candles. fixed popcorn, got sodas and prepared to watch the Cinderella show that I had told them about their whole lives! When it finally aired, we began watching with great anticipation. Katie Lea and Caroline kept looking at me ...saying with their eyes, "Is this what you've been talking about so long?" I reiterated that it was going to get better. We kept waiting. It didn't get better. We were all disappointed. Leslie Ann Warren was pretty, but not nearly as pretty as I remembered. The prince was hokey looking and the acting was just plain bad. I think that's the way it is. So often I (we?) dream of something that is going to be so glorious, fantasy filled and "happily ever after" and then it happens and BAM! It's not anything like we imagined. Oh, no. It's so much worse! Vann an d I married two months before Princess Di and Charles married. The media buzz that was created about their union was phenomenal. We all know how that "happily ever after" story ended. 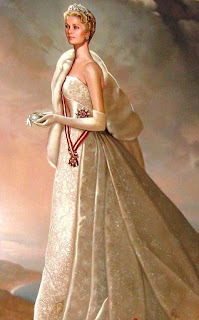 Princess Grace of Monocco was first a movie star and then had the beautiful fairy tale wedding. I read her biography and her life was so much "smoke." She lived her life trying to please her earthly father, all the while living a pretty immoral lifestyle and then thought her father would finally approve if she married a prince. Then, that wasn't happily ever after either. As I've matured I've come to realize that I really am a princess. I'm a daughter of the king. Thank you, Father. I don't have a castle (yet :) but will one day. I think it will be a mansion that looks like a castle. My father came and rescued me...not on a white horse, but by sending his son to die for me. That requires so much more sacrifice than just riding up on a white horse. Thank you. I don't have to "be" anything other than what my father created me to be. 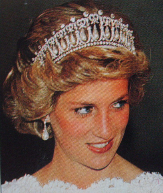 Princess Di was so burdened with the way she was supposed to "be" to be a suitable princess. My father's yoke is easy and his burden is light. I'm so thankful my father is a king and I'm a princess. Not the kind with the crown but a princess, loved by her heavenly father all the same. He gave everything for me. I'm living my "happily ever after" because of my dad. I hope you are, too. If not, he so wants to love on you, scoop you up in his arms and let you know you are his daughter (or son), too. I love this post. I have three daughters and I'm trying to instil this message in their hearts. Thank you for sharing your thoughts. I'm also putting forward the book you suggested at our next book club. Thanks for stopping by. I loved your new header. There is something special about princesses and tiara's, a little girls dream. But you are so right, earthly crowns come with a heavy burden. This reminds me of a line from a poem I wrote a few years ago.. I think that so many young women I know are caught up in trying to be a princess that they forget they already are one. There's this sense of Godly fearlessness when one realizes that you're "already there". No it isn't always enjoyable, and there are times we have to cling to our Father for dear life.. but we aren't struggling to become.. we're reaching further, breathing deeper. I, too, love the new header! I'm just now embracing my Princess-ness and viewing myself as an Heiress of His Kingdom! Was wonderful to finally hug face to face yesterday! J. Make Me a Servant, Lord?